Maybe Canada’s Armed Forces are fighting a Wendigo infestation no one knows about. Perhaps they’re engaged in a secret war against Bigfoot and his moose army for control of the Northwest Passage. There's also the reality that Canada is a NATO partner and fights regular wars overseas; Canadian troops fought alongside American ones in Afghanistan from 2001 until March 2014. 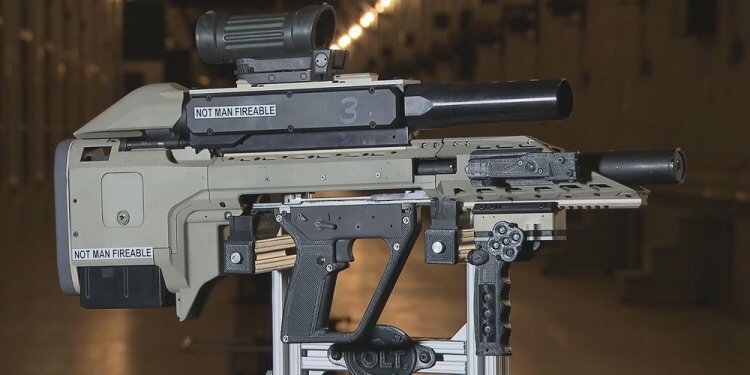 Well, to make Canada ready to take on their next foe, Colt Canada just released a video demonstration of a new prototype gun for the Canadian military. And it looks ridiculous. The gun is a “bullpup, ” meaning the magazine is fed into the gun behind the trigger rather than in front. The main effect of the bullpup design is that rifles can be shorter without losing any effectiveness. The gun can install either a three-round grenade launcher or a shotgun. Shotguns are useful in close quarters, while grenade launchers give more range than just hand-tossing a small explosive. The main gun fires 5.56 ammo, a standard NATO round. Future plans for the gun include smart targeting systems, like those found in TrackingPoint rifles.